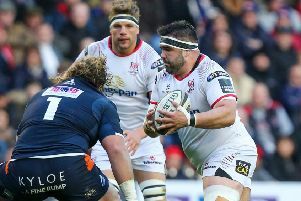 There was last minute drama in Belfast on Saturday afternoon as Ulster snatched a late victory over Scarlets and make it another winning start to the PRO14 season. The visitors - who saw Jonathan Davies withdraw with a hamstring issue before kick-off - scored after just six minutes when Patchell took the ball blind and broke John Cooney's tackle to cross the line. Cooney then put Ulster's first points on the board with a 12th minute penalty after the Irish province had secured a scrum penalty. The Scarlets' lead was then cut to just a point thanks to Cooney's second well-struck penalty, after 16 minutes, which came after a high tackle on Craig Gilroy. Just after the 20th minute and with new signing Will Addison looking sharp, Ulster built some impressive phases in Scarlets' 22 which leading to another penalty which Cooney duly converted to nudge the home side in front. Then, on 67 minutes, Scarlets' replacement Ed Kennedy was yellow-carded for leading with the shoulder on Henry Speight.